Drilling mud mixing system is used to prepare and stock new drilling mud for drilling rigs. It is widely used for different kinds of mud system. 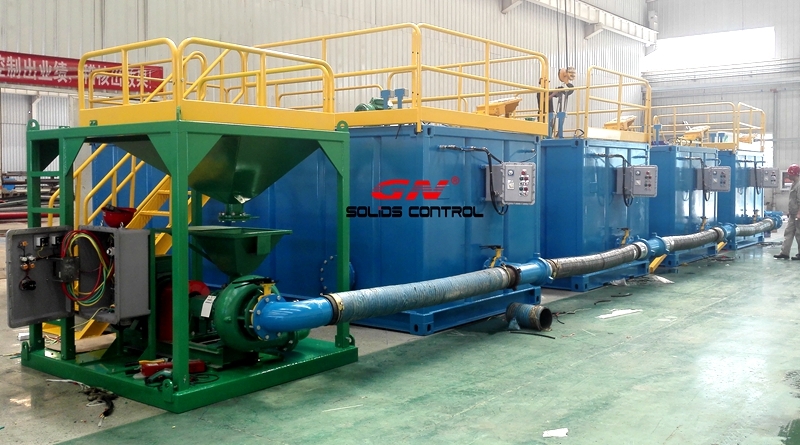 Recently, GN Solids Control dispatched a 120m3 (750bbl) mud mixing system for a trenchless project. The client keeps buying mud system from GN for many years. GN customized color per the client’s request. The Mixing system is the combination of a jet mud mixer and an elevated hopper. The jet mud mixer is GN standard mixing system. It is equipped with a high efficiency centrifugal pump (37kw, 50hp) and a siphon hopper. The mixing capacity of the jet mud mixer can reach up to 150cbm per hour. The elevated hopper volume is 1cbm. It is specially design for big bag bentonite. Compared with small bag bentonite, the utilizing of big gas can save time for mixing, and save the cost on chemicals as well. The mixing and storage tank system consists of 4 mud tanks. The 4 mud tanks are designed with the same size as 20ft container. There are 2 ea 7.5kw (10hp) mud agitator for each mud tank. The 4 tanks are linked at a unit with pipes, but controlled by separated electrical system. The separate control system for each tank helps the clients flexible for operation. Jobsite people is convenient to change the type of each tank, or mixing different mud for each tank to meet the special requirement of drilling activities. 2) Desanding plant for piping, micro tunneling, and other no dig activities.